Medium - $80.99 Only 3 left! X-Large - $80.99 Only 6 left! Let’s face it you’ve matured over the years. Running around in costumes designed after terrifying monsters or your favorite fictional characters was fun and all but that’s in the past now. You’ve got a respectable reputation and you can’t risk being seen dressed up as a caveman or werewolf by your co-workers or, worse, your boss. However, you don’t want to be known as the annual party pooper by your friends whenever Halloween rolls around. Well, that is where we come in! Allow us to introduce you to your new favorite Halloween apparel. 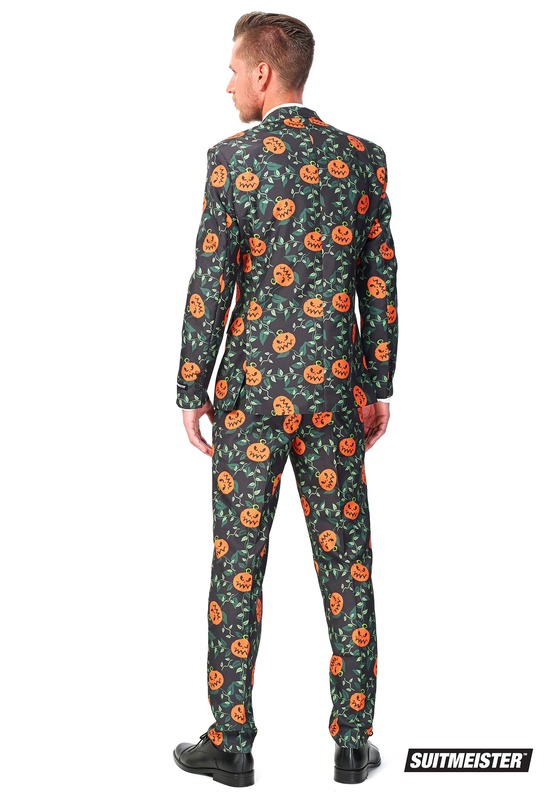 This is the Men’s Basic Pumpkin Suit brought to you by SuitMeister. When you toss on this three-piece outfit you’ll be the classiest guest at any costume party as well as the most festive. 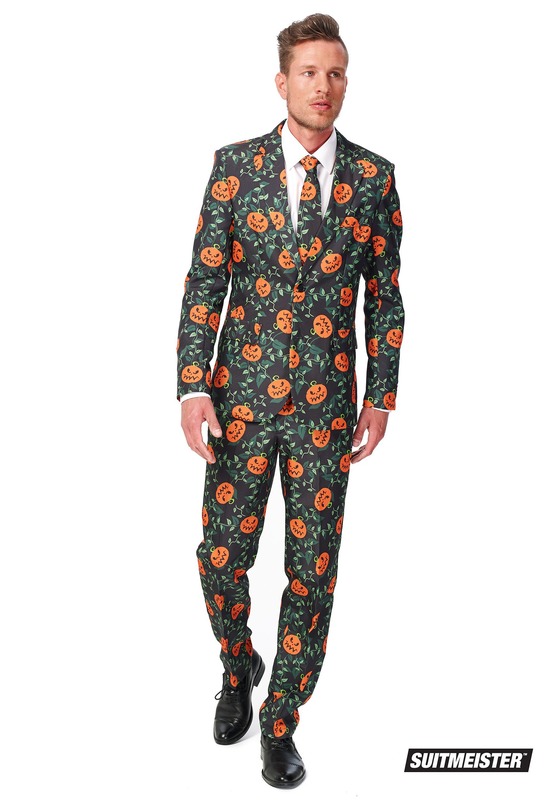 With spooky jack-o-lanterns and creepy vines printed all over the suit jacket, pants, and even the tie, you will be glowing with Halloween cheer from head to toe! So toss on these formal yet festive duds and enjoy celebrating your favorite holiday to its fullest. You can be completely confident that, if you should happen to run into someone from the office while out and about, your reputation will remain intact. When others see that it’s possible to make stylish with a hint of spooky look as good as you do, you may even start a whole new trend. If there is one thing that moves you up that business ladder it’s proving that you’re trendy, not a follower but a leader. You’ve got to be the change you want to see, right? Well, if you want to prove that Halloween can be celebrated with some class, grab this costume and hit the dance floor!